Minorca's capital town, Mahón, is an unavoidable port of call for visitors arriving on the island, and most head for the string of restaurants and cafes that line the harbour, before passing through to other destinations on the island. The town itself is sedate and conservative, featuring classic Georgian townhouses (bearing testimony to the British occupation of bygone days) and tall apartment blocks. Mahon does have some worthwhile attractions for those interested in making more of their holiday than dashing off to the beach. The mansion house of Golden Farm overlooks the harbour, and was once occupied by Admiral Lord Nelson. Also on the sightseeing list is the Xoriguer Gin Distillery, where famed Minorcan gin is produced in an age-old process. The celebrated organ (with more than 3,000 pipes) in the church of Esglesia de Santa Maria la Major is also a draw for some visitors; the Swiss-made organ was brought to Mahon during the Napoleonic wars and is used during an annual music festival held in July and August. 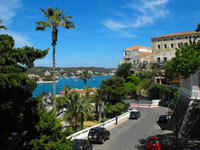 The historic centre of Mahon has been steadily renovated in recent years, and the old part of town is picturesque. The city has one of the deepest natural harbours in the world, and the waterfront is a worthy tourist hub with lots to see and do.